← What an AMAZING Weekend! So, it’s been a month to the day since my last blog posting and so much has happened. My household has battled the flu, the holiday season and the post-holiday let down (read: so it’s -30 below wind chill in MN and the holidays are over…now what??) Spring can’t come fast enough, but I know that the bulk of the winter season still lies ahead of me, and so I am trying to make the best of it. At least when it’s cold, I can squirrel away in my studio and create! Tonight I grouted a series of five pieces and realized that, for me, grouting a piece is the hardest part of the process and yet also the most fulfilling in the end. No matter whether the piece is big or small, there is always a moment where my stomach drops out after I’ve smeared on my first handful of grout. I’m not sure if it’s the idea of covering all of the tiny pieces of pretty glass that I carefully placed one by one with charcoal colored gook or what, but that moment always comes and I must decide to continue or scrap the piece. It’s a leap of faith to trust that it will all work out in the end. I have never scrapped a piece mid-grouting and it nearly always works out so much better than I could have planned, but that small intake of breath always comes and I must decide to press on in spite of it. 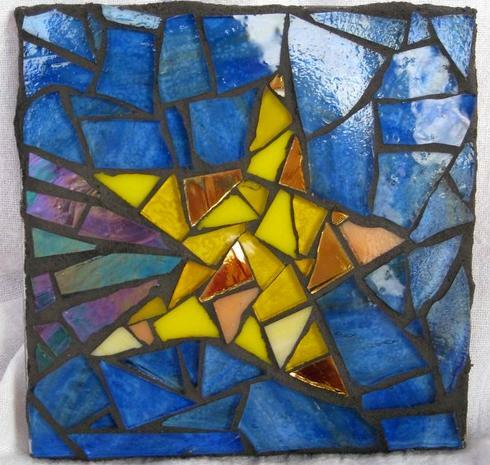 Everything else about the process comes seamlessly, like breathing, but there is always a decision to be made as I start the grouting process. My experience tonight in a quiet studio–no music on in the background–got me to wondering about that instant. Inevitably, as the grout begins to set and I remove the first thick layer of excess, I mentally exhale and realize that it will be fine. It all starts to look like I envisioned in my mind’s eye. It isn’t going to be a misshapen blob covered with gritty concrete frosting after all. (Whew!) Then comes the tedious and yet delightful process of rediscovering each piece of tile or glass or china as I remove unwanted grout like an archeologist removes dust from a fossil. It is in this final stage that the piece truly comes alive and takes on a life of its own. It is at this stage that it is clear to me what was beckoning from the bits and shards in my studio. Even though it all works out in the end, I still have that moment of “what if?” I am guessing that this is true for more than me. Life works out in the end, but sometimes your brain kicks in and says, “what are you doing?” and you must press forward with the plan anyway. Trust that the net will appear or you will be taught how to fly. 2010 has already revealed itself to me as a year with the potential for great things, but we (all of us) are going to have to take that leap of faith. I encourage you to make that most of each moment, to press forward faithfully toward your dreams, and trust what your heart knows to be true. PS…Pics of the new work coming soon…tomorrow maybe? ?